Cynthia Jefferies is a friend of mine. My name appears in the acknowledgements of this novel. I always begin reviews of books by friends with a declaration like this because I don't want to end up on the back pages of Private Eye accused of logrolling. I hope readers of this blog will believe me when I say I would not recommend a book I didn't enjoy. If I'm not liking a book, I stop reading it. Pleasure is what I'm after. And pleasure is what The Outrageous Fortune of Abel Morgan provides. Not just a general pleasure either, but several different kinds of pleasure at the same time. First, there's the narrative, which follows two people: Christopher Morgan and his son, Abel. Chapters from each point of view alternate for most of the novel and Jefferies has Christopher's account unfold in the third person while his son gives a first person account of events. By doing this, she varies the tone and style, and makes things much more interesting. Secondly, readers of this book won't be bored. I'm going to use a reviewer's cliché and call it a 'roller-coaster ride.' It's a very exciting story, full of adventures, secrets, mistakes that seem uncorrectable, wicked men, a woman who's far from angelic, pirates, slaves, and traffickers, smugglers and even a walk on appearance from King Charles II and Samuel Pepys. I'm going to give away nothing about the plot, except to say that the widowed Christopher is left with a baby to care for. He loses the child, then finds him, then loses him again. He spends the best part of the novel on a quest to find him. And while he does this, Abel is having adventures of his own. Thirdly, the characters (and we meet many) are brought to life very well. We can see them and hear them and several of them (especially the villain with the false arm and hand) stay in your mind long after you've closed the book. We care about Abel and his father because Jeffries has involved us so closely in their thoughts and feelings. Fourthly, every place we visit as we're reading is vividly there. We move from the West Country to Constantinople, to London, to the Caribbean, to Jamaica and the Netherlands and it's wonderful to be able to travel so far while sitting snugly by the fire. I did actually read some of this book in front of my gas fire while my central heating was briefly on the blink, and it's the perfect way to enjoy this story. Because my main feeling as I read was that this is an old-fashioned novel in the very best sense of the term: happy to tell a thrilling and moving story in elegant and evocative prose and above all, one that everyone in the family can share. I really hope there's an audio version on the way. Listening to that would be a splendid way to pass a long car journey. Meanwhile, I can heartily recommend the book. All other photos provided by Cynthia Jefferies. Today is the last day to enter our competition to win a copy of The Outrageous Fortune of Abel Morgan! See the post for 31st October for details. Thank you Adele. I’m glad you enjoyed it! I do love going on journeys like this on the page. 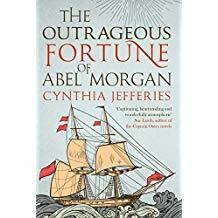 Must say that The Outrageous Fortune of Abel Morgan sounds ideal for cosy winter reading.